Our project started in November 2011, when a letter was sent to the Parish Council commenting on the poor state of repair of the play area. The field is in the centre of our village. The land was given to the Parish in the 1920’s for use as a recreation ground and there has been a cricket pitch there ever since. A group of volunteers got together and produced a questionnaire, followed by a public consultation and fundraising began. 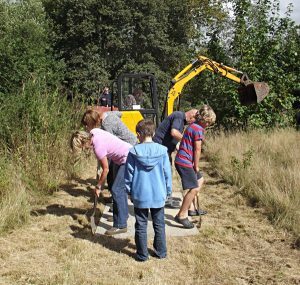 The project soon evolved to include the adjoining overgrown field and in September 2013 an all weather path was laid and the old pond near the path was dug out, cleared and reinstated. All the work was done by volunteers from the village. A bench donated by the W.I. was placed by the path for people to rest. 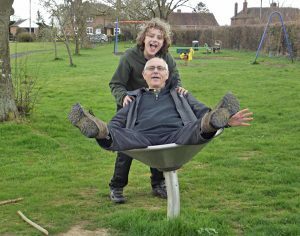 June 2014 saw the first piece of play equipment installed – a nest swing that could be enjoyed by all ages, funded in part by the Kent Community Fund matching funds with the Group’s money that they had raised. This was followed later in the year by a climbing log cabin, a gravity spinning bowl and swing bars with money from Awards for All – from the Lottery Fund – along with some nest boxes and a hedgehog house. As the path was so popular it was extended to the gate making all year round accessibility to the field. A junior wildlife group started with a meeting to conduct a small mammal survey the results of which were sent to the Kent Mammal Group providing information for their survey. The next event was learning to make a woodland fire with flint and steel and cooking damper bread. 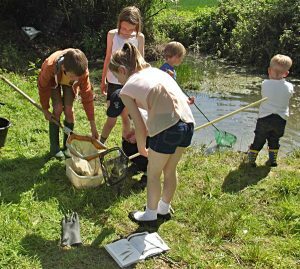 The restored pond was ready for pond dipping and an abundance of wildlife found including three types of newt, beetles and water spiders, confirming a healthy pond. Another morning was spent building a bug hotel out of donated pallets and garden materials. The conservation side has become important and the boundary stream was dug out to lower the impact of flooding and open up a riverside walk. Hibernaculars were built along the edge and bird boxes put up. November 2015 saw the first planting of the community orchard, which now has apples, plums, pears, cherries, cob nuts and a walnut tree, some of which have been sponsored by local residents. There are plans to add to this in future years, and to plant a Willow Tunnel and create a wildflower area. Fundraising is ongoing to provide more play equipment, for new projects and for upkeep of the field. It is hoped more people will become involved and carry on the works for future generations. Fundraising events include an annual Afternoon Tea in the Field, when afternoon teas are served with sandwiches, cakes and scones. There are working party days organised for volunteers to help plant and clear, which are usually accompanied by tea and home made cake. The field is now more readily accessed and enjoyed much more with the children playing on the new equipment, dog walkers being able to enjoy the paths and people spotting the abundance of wildlife.